Similar to most areas of the Okanagan, the Greater Westside is a popular destination for tourists, business professionals, and new residents. Our visually stunning community and four-season playground offer something for everyone to enjoy. People from all over the world come to the Greater Westside to enjoy the scenic vistas, great people, and to experience the overall “quality of life”. Clean air, green space, beautiful lake and hillside views, along with a good climate; make the Greater Westside a desirable community to live, work, and play year-round. Beaches, parks, hiking, biking, cross country skiing, various shops, restaurants, arenas, vineyards, orchards, wineries and resorts are just a short list of all of the attractions you will find among the Greater Westside area. Made up of two different communities, the Greater Westside is governed by West Kelowna City, as well as Westbank First Nation (WFN). Both West Kelowna City and WFN have formed a seamless community that transcends borders. The stunning sceneries and the warm and welcoming hospitality of the two communities together as one will surely impress visitors and future residents. In 2007, the community voted to incorporate the west side into a District Municipality. Before incorporation, it had been governed as a rural area of the Regional District of Central Okanagan and the Province of BC. Ever since incorporation on December 6, 2007 the Greater Westside has experienced rapid growth residentially, industrially and commercially making a name for itself. 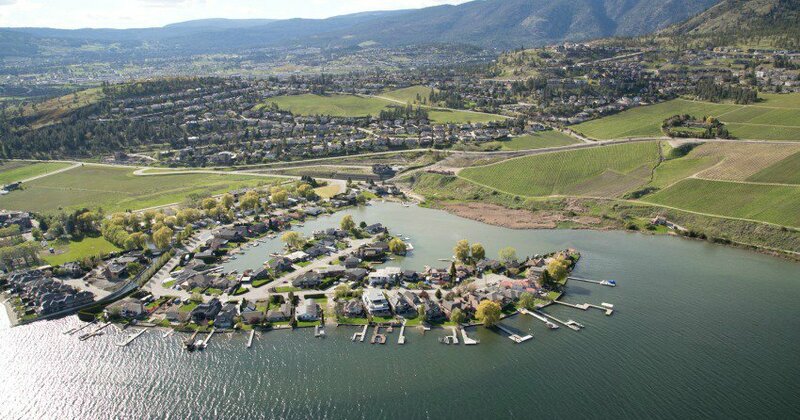 With a population of approximately 30,000 residents, West Kelowna City provides a landscape with a mix of residential areas, orchards, vineyards, small store shopping and services, and a light industrial area. In 2005, Westbank First Nation became the first self-governing First Nation community in Canada. Approximately 9,000 residents of the Greater Westside reside on WFN lands, with 742 of those residents being band members. Westbank First Nation encompasses residential neighborhoods of all sizes, along with modern shopping in a big box retail environment, Two Eagles Golf Course and a number of hotels. When travelling through the Greater Westside, you will notice the Okanagan language on street signs, along with First Nation art and symbols incorporated into signage and buildings throughout the area. The Greater Westside area is a four season playground because of the year round facilities and attractions it has to offer. Summer months attract visitors for warm climate, sunny beaches, swimming, hiking, biking, boating, picnics, parks, beautiful scenery, and the delicious abundance of fresh fruit. Our plentiful orchards, vineyards and wineries provide visitors with a memorable experience on the Westside Wine Trail; a total of eight family owned wineries/culinary professionals positioned conveniently along the trail. During the winter months, Crystal Mountain Ski Resort in Westbank is a well-known family style ski facility and Telemark Nordic Club offers an excellent setting for cross country skiing and snow shoeing. The Westbank Visitor Centre operates year-round and provides information services to all visitors of the Greater Westside area. Located in the Westbank Museum, you will find plenty of information about the Greater Westside area and learn a little bit about our history. If you have any questions regarding tourism on the Greater Westside, you can find more information at http://visitwestside.com/ or contact the Visitor Centre at 250-768-2712 or wkvisitorcentre@gmail.com and info@westbankmuseum.com.